ZAMBOANGA CITY, Philippines - Mindanao Examiner now streams some 70 online radios, television broadcasts and is putting up more stations for the benefit of Internet communities not only in the Philippines, but around the world, as part of its continuing improvement in the field of Information and Technology. The Mindanao Examiner is founded in Zamboanga City in 2006 and has launched a weekly newspaper with circulations in many parts of the southern Philippines. 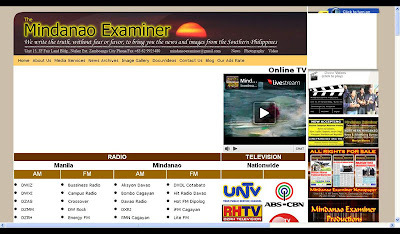 The company, whose website can be accessed on this URL – www.mindanaoexaminer.com – has expanded its business in 2010 to include cable television production and currently manages and operates Sky Cable Mindanao Examiner TV on Channel 54 in Zamboanga City. It also has its own multi-media department, Mindanao Examiner Productions, which is in-charge of all video productions, photography services. It has provided photography and video works for various corporations and companies operating in the Philippines, including local government units in the southern Philippines and foreign media firms. The Mindanao Examiner has produced several corporate and tourism videos and independent short films, including a full-length bio-film in the past. The Mindanao Examiner also offers corporate media consultancy. It advocates citizen journalism and a strong advocate of press freedom, and has a pro-poor program for the less fortunate sector in the community. Its office is located at 3rd Floor, Fair Land Building, Nunez Extension, Zamboanga City. Its staffs operate pro-bono.